This post is part of our look at data on Pakistan. Please read the introduction here for details. The decline of artistic industries in Pakistan is often lamented. Rather quickly, without a closer look, this is often attributed to ‘Talibanisation’ of the country. Below a quick look at the official numbers from the Pakistan Bureau of Statistics. All numbers are only officially registered, the unofficial numbers may be higher. I would love to hear opinions in the comments. The numbers of cinemas has decreased drastically (Figure 1), the least in KP, the province where reports on cinemas shutting down are most ample. This is also documented by the Mazhar database. Just like cinemas, also the numbers of films produced has decreased (Figure 2). Again, only Pashto movies seem to be rather unaffected by the decline. In 2011 two films were produced in Seraiki, none at all in Sindhi or Baloch show up in the statistics. Documentary films are also tracked but numbers are patchy and seem more unreliable than numbers on feature films. For Dramas aired on TV and Radio, times seem less difficult just judging by the numbers (Figure 3). 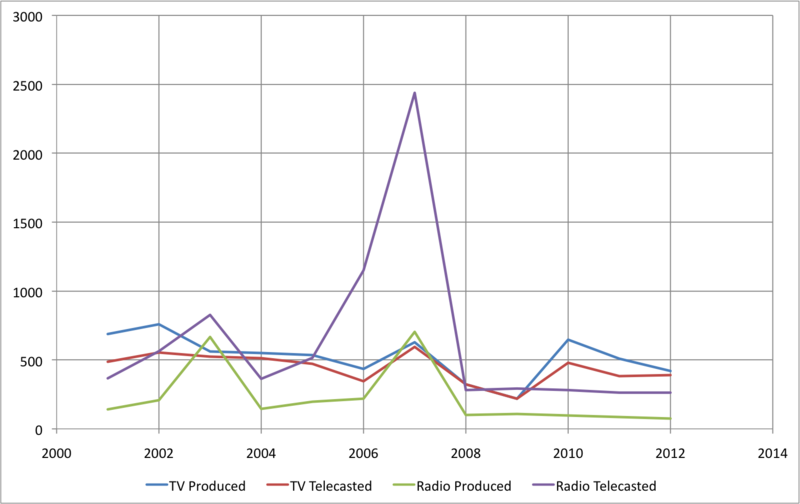 It is unclear what caused the spikes in 2003 and 2007 in radio productions, neither are there any data on language or locality of production. Although not directly comparable to commercial culture data, newspaper statistics are collected by the Bureau of Statistics as well and do give some idea what the writing landscape may look like. Again, these datasets are often patchy and have weird shapes that may mainly be attributable to changes in data acquisition or simply inaccurate data collection. Perhaps in some cases real reasons can be given. 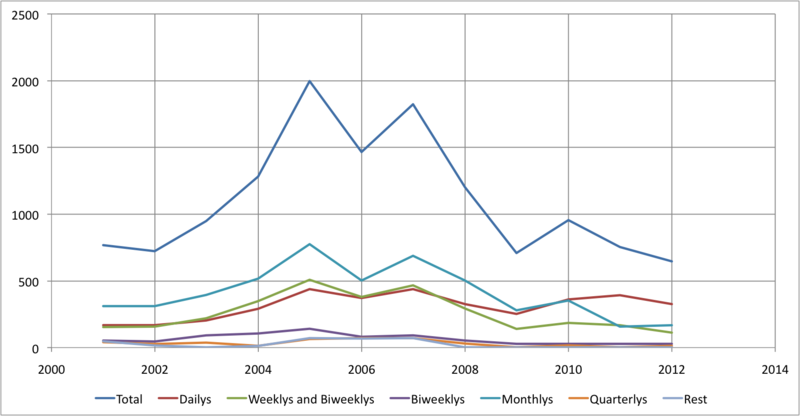 Figure 4 a – 4 e looks at Newspapers by type [Data]. 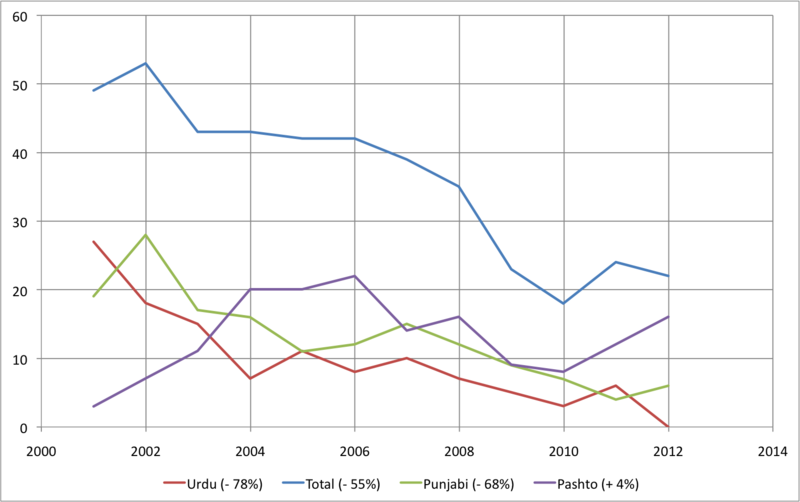 Most striking is the rise in total numbers between 2004 and 2008, mostly stemming from Punjab and KP, and the subsequent decline. What are reasonable explanations from changes in politics (the last Musharraf years) for this development? Also the numbers for Balochistan are surprisingly high and the province seems to be the only one with a long-term positive trend. Are the number dodgy or is there really a positive development of media quantity in the most underreported province in the country? Or has there been simply an influx from media outlets from outside, publishing mainly national content? 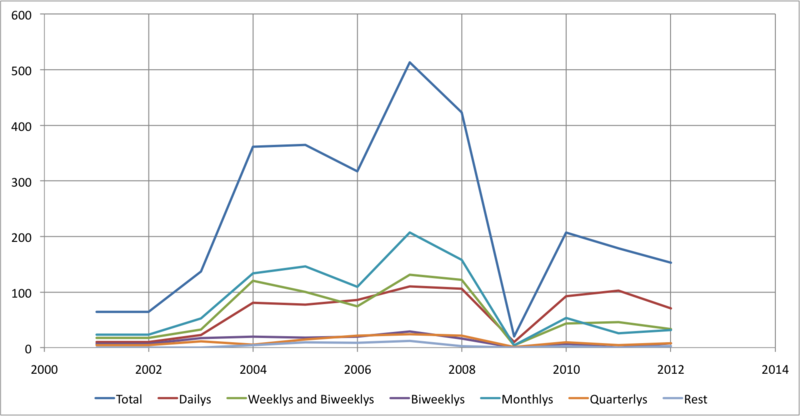 Figure 4b: Newspapers by type in KP. Figure 4c: Newspapers by type in Punjab. Figure 4d: Newspapers by type in Sindh. 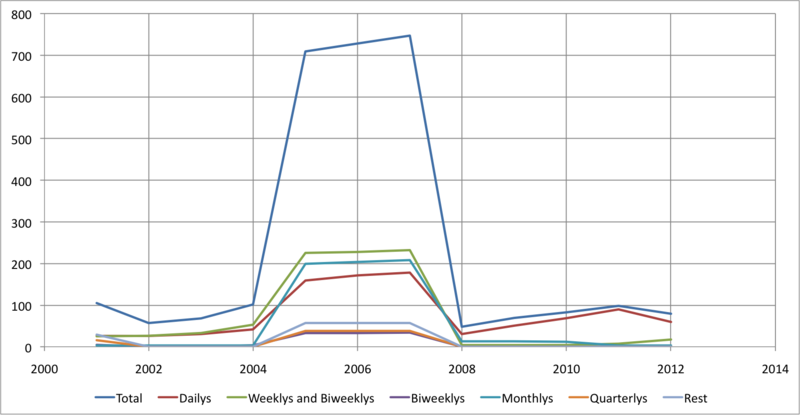 Figure 4e: Newspapers by type in Balochistan. 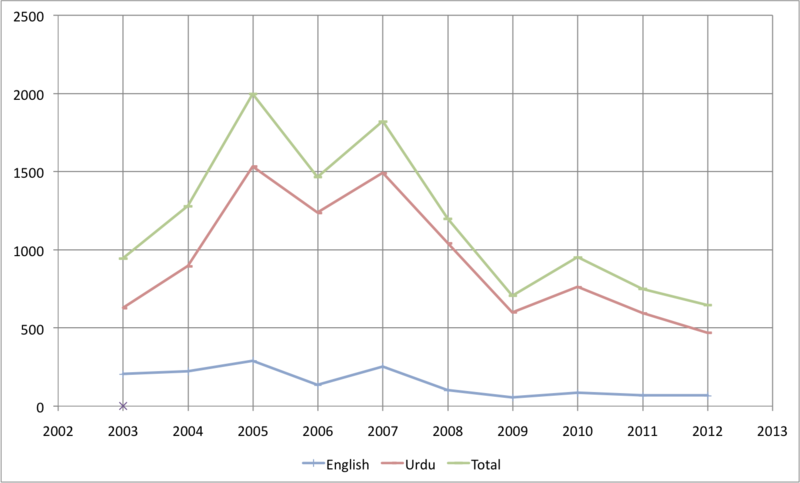 Language wise [Data], most newspapers in Pakistan are printed in Urdu, followed by English (Figure 5a). Together they made up a share of 96 % in 2007, which dropped to 83 % in 2012. 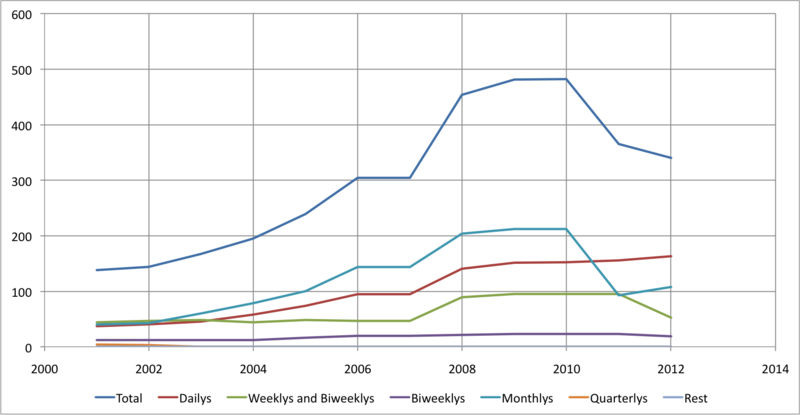 English newspapers decreased by 66 % from 2003 to 2012, Urdu newspapers by 25 %. The two main languages are followed by Pashto (increase from 9 publications to 17), Sindhi (decrease from 53 to just one, an unlikely development) and Balochi (stable from 11 to 12) (Figures 5b and 5c). Fig. 5a: Urdu and English Newspapers in Pakistan account for 80 to 95 % of the publications. 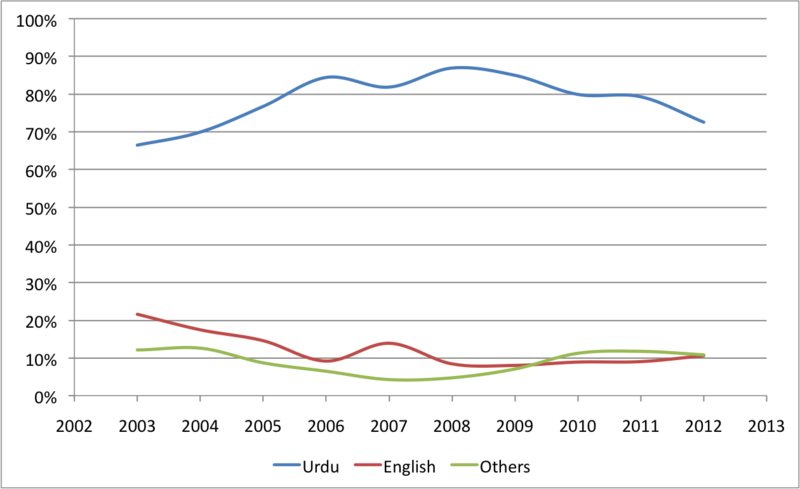 Figure 5b: In relative numbers, languages from the provinces have caught up on English publications, while Urdu publications have only lost relatively few outlets. Figure 5c: The most important other newspaper languages are Pashto, Balochi and Sindhi. Others include, in decreasing order, a number of unspecified languages, Gujrati, Punjabi, Brahvi, Seraiki and Arabic. 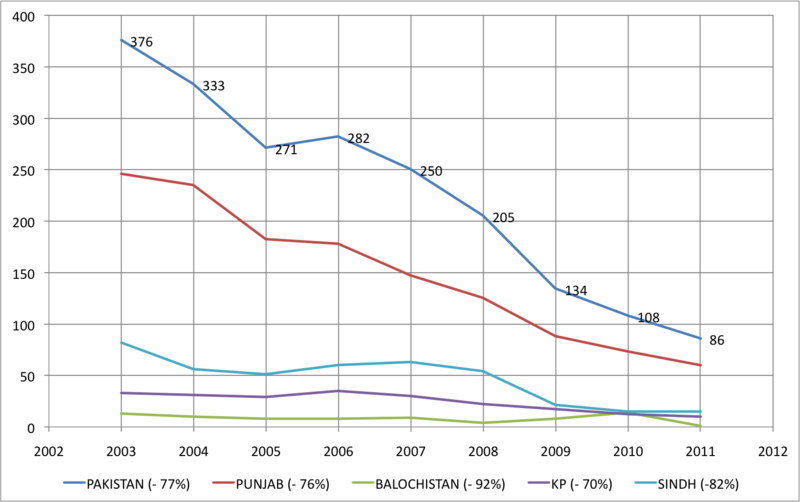 The data for the provinces are displayed in Figure 6 a – d.In Punjab the local language (Punjabi) is represented most poorly in the newspaper landscape, reaching at max 1 % of the coverage. In Sindh (Sindhi) this number is between 5 and 30 %, in KP (Pashto) as well as in Balochistan (Balochi, Brahvi and Pashto) between 3 and 9 %. Figure 6a: Newspaper Languages in Punjab. Punjabi Publications were between 2 and 7. Many newspapers are registered under Others although Pashto, Sindhi and Seraiki are mentioned separately. There seems to be a lapse of data acquisition. 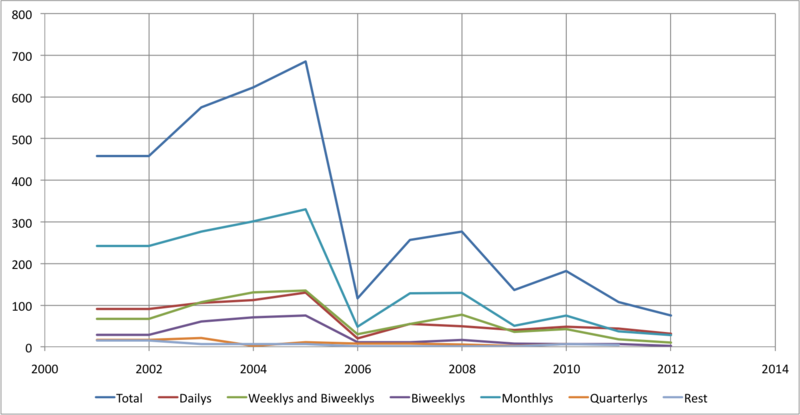 Figure 6b: Newspaper languages in KP. 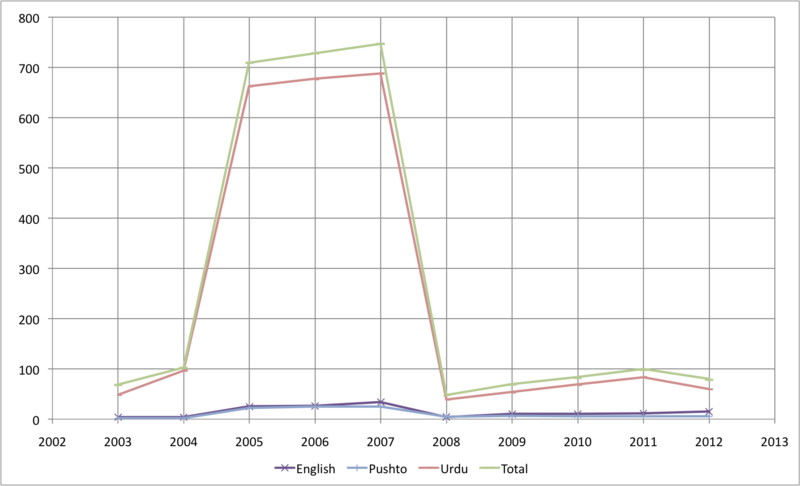 Pashto publications stood at 5 in 2012 versus 25 in English. Figure 6c: Newspaper languages in Balochistan. 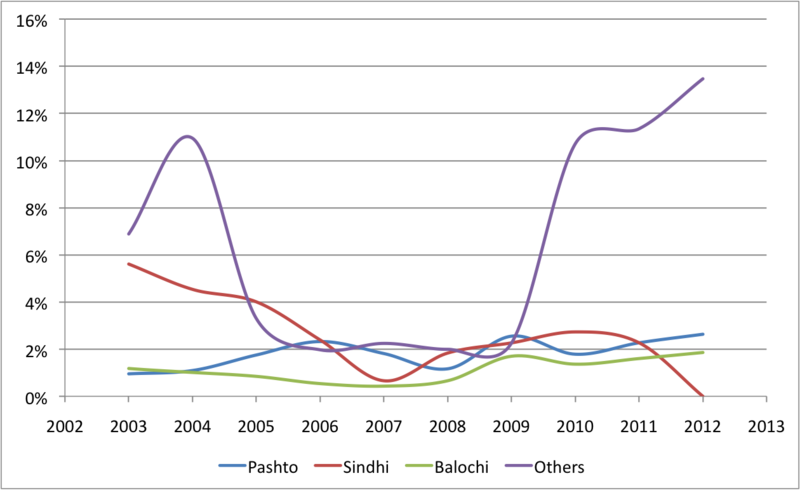 Balochi publications were three times more numerous than those in Brahvi in 2012 (12 and 4). Papers in English stood at 28. Figure 6d: Newspaper languages in Sindh. Most Arabic (max. 5), Seraiki (max. 4) and Gujrati (13 in 2003 and none today) publications were registered here. Pashto cinema and interest in cinema from KPK to be higher is also validated by online search trends data throughout last many years so no surprise there as well. Radio spikes, now: City FM89 was launched in 2004 but the test transmission and pre-launch hype could be attributed to the first spike. The second spike happened during a year with the biggest political news of the decade: assassination of Benazir Bhutto. Considering the Gallup survey of March 2007, 90% of Pakistani population listened to Radio Pakistan and with such a big event, one can expect the spike of interest and tuning in to radio during those times. From 2006’s end to the end of 2007, political turmoil and activity surrounding the return of Benazir was all time high with some cable blackout happening sporadically so naturally people would flock to internet and radio – the less moderated mediums during those times. Baloch newspapers have definitely been rising slowly but gradually in part due to the further rise of nationalism post-Bugti era, rangers-led operation and almost total blackout of coverage of Balochistan news by Pakistani mainstream media. This is again validated through online news consumption of Baloch news by national and expat audiences. At the end of Musharraf era, KPK and Punjab probably couldn’t care less about the arrival of PPP-led Govt. while politics has never been such a hot topic in Punjab, the sudden decline was probably an indication of disappointment of PMLN supports from Punjab but later picking up again because of the cat-and-mouse chase the opposition (PMLN) and ruling Govt. (PPP) went on for endless months. Yes, your observations are correct. I am also interested in sudden decline around 2007 and that was the time when Musharraf imposed second emergency; Musharraf was already struggling and trying to control the flow of information thus a decline, I suppose. But that happened a lot earlier in Sindh, a province always ruled by PPP which was at loggerheads with Musharraf government even before Benazir landed, plus the province has always been seen as having anti-establishment spirit and had been at the receiving end during military dictators rule. I am wondering if the Others newspapers rise can be attributed to Gilgit-Baltistan being given self-governing status around the same time?